Electro-mechanical devices are an example of coupled multi-disciplinary weakly non-linear systems. Dynamics of such systems is described in this paper by means of two mutually coupled differential equations. The first one, describing an electrical system, is of the first order and the second one, for mechanical system, is of the second order. The governing equations are coupled via linear and weakly non-linear terms. A classical perturbation method, a method of multiple scales, is used to find a steady-state response of the electro-mechanical system exposed to a harmonic close-resonance mechanical excitation. The results are verified using a numerical model created in MATLAB Simulink environment. 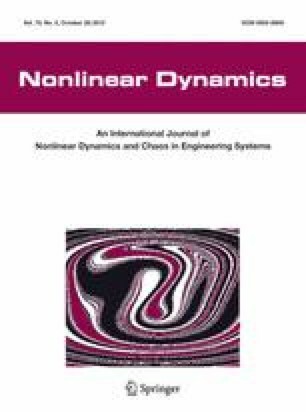 Effect of non-linear terms on dynamical response of the coupled system is investigated; the backbone and envelope curves are analyzed. The two phenomena, which exist in the electro-mechanical system: (a) detuning (i.e. a natural frequency variation) and (b) damping (i.e. a decay in the amplitude of vibration), are analyzed further. An applicability range of the mathematical model is assessed. Financial support by InterReg IV A—the Silent Spaces Project is gratefully acknowledged.